An agreement to redevelop a Nottingham shopping centre will help transform the city into a major retail destination, officials hope. 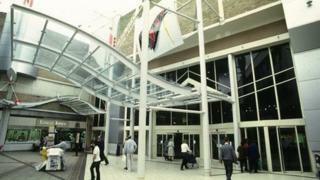 It follows long running negotiations over the Broadmarsh and Victoria centres in the city. Owners Intu wanted to develop the Victoria Centre first but the city council said the Broadmarsh was a priority. The council is proposing a £50m contribution to its redevelopment. The total cost to renovate both centres is about £390m. Council leader Jon Collins, said: "This is a significant step and will help to transform the vitality and viability of the southern part of the city centre." He said: "The redevelopment of the Broadmarsh Centre is about securing the long term future of the city centre shopping offer." The scheme, said Mr Collins, was the right one, and he was confident Intu "have demonstrated their commitment to Nottingham and will deliver what they say they will deliver". Intu is yet to comment on the plans. The proposals are due to be considered at the council's executive board meeting on 19 November.